Ansel Adams is rightly celebrated for his iconic images of Yosemite, National Parks and the Southwest. 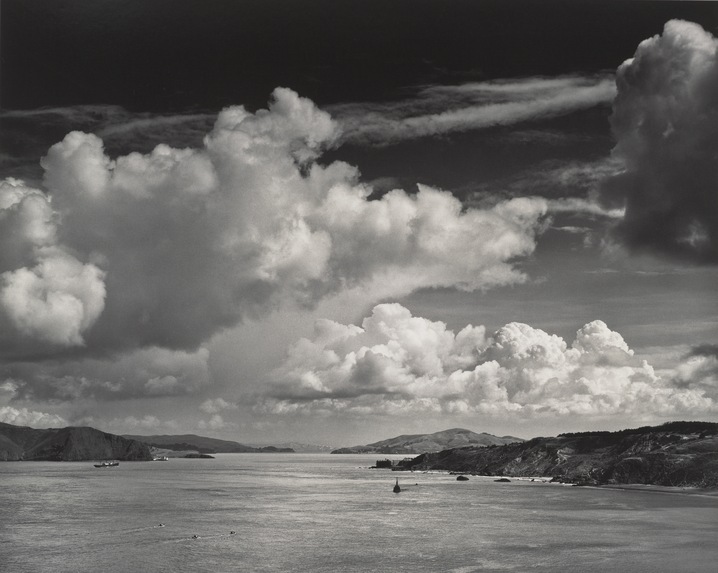 We sometimes overlook some of his more sublime images from his home in San Francisco and the Bay Area. The Golden Gate and Bridge from Baker Beach, San Francisco, CA, 1953— Long before the bridge was built, the teenage Adams often took the streetcar from his home near Baker Beach to the waterfront downtown, caught the ferry across the Golden Gate, and spent the day roaming the Marin hills seen to the left this photograph. Compare this image with the Adams’ earlier view without the bridge (above) made in 1932. In the 1960s, the Sierra Club, with Adams’ help, found the proposal to allow construction of high-rise apartment building on these hills. As a protest, he pasted tiny pictures of apartment building on top of the hills in this photograph and exhibited it in a San Francisco storefront. The Golden Gate National Recreation Area was established in 1972 and now protects these headlands.